Simple, beautiful, comfortable. This is the tool that launched OXO, a company that pioneered universal design in everyday utensils. 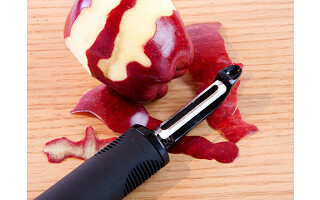 The romantic back story: One night, while then-retired housewares executive Sam Farber and his wife Betsey were preparing dinner for friends, he noticed how much it hurt Betsey to peel apples for a French tart. Farber vowed to create a better peeler for Betsey, who suffered from mild arthritis. Hundreds of prototypes later, Betsey got her new and improved peeler and an innovative company was born. I’ve owned my OXO swivel peeler for so long, that I sometimes take this tool’s amazing design for granted. Like Betsy, I suffered at the hands of my old metal peeler. It left my fingers cramped and aching whenever I prepped mashed potatoes or gingered carrot soup. But my OXO swivel peeler practically massages me when I use it. My thumb and forefinger rest comfortably in its perfect, squishy indentations. Its thick, grip-able rubber body cushions my hand (so my palm never feels strained) while the stainless steel blade glides through veggie skins with ease. Best of all, the OXO swivel peeler is built to last. After more than 10 years, mine is still going strong. The OXO brand has long been associated with intelligent innovation, designed around comfort, ease and performance in the use of everyday things. Our product development philosophy is based on a movement called Universal Design, which takes into consideration the needs of the widest possible spectrum of users. OXO builds on this idea by identifying problems and inefficiencies with existing products (including our own), not only in terms of comfort, but performance as well. This provides the foundation for products that offer tangible improvements, and helps us meet our mission of providing innovative products that make everyday living easier. We are delighted to have our flagship GOOD GRIPS® Swivel Peeler featured during Daily Grommet's "best of" week! We look forward to your comments! Like Joanne, I've had one of those peelers for many, many years. My friends here at Daily Grommet know I'm not exactly Martha Stewart at home -- but this is one kitchen tool that actually makes me feel like I know what I'm doing! Comfy and easy to use -- it's a winner all around. I feel like Cinderella, I peel so many veggies. This looks cool. Is there a giveaway today for it, and if yes, how do I enter? @Carol, every so often we do have a special giveaway opportunity, but not today. These peelers are an amazing value, though. And they really are terrific! Yay! Somedays it's just the affirmation that you already own the best out there that makes you smile. Thanks! I agree, it's a good one! I love this peeler. I have had mine for well over 10 years. Worth every penny! I've had one of these peelers for at least 5 years and it is as good today as it ever was and it's seen a LOT of use. It does fit beautifully in your hand - as do all of the OXO products. It's so great to hear this feedback! It just reinforces what we do every day. I have owned one for years and it is truly THE BEST!!! I have used one of these for years and it is simply the best one around! Two days ago I bought an Oxo product that I was so thrilled with, I brought it to a meeting and showed it off that night.... they make a neat scrub brush that carries the dish detergent in the handle and dabs release through the brush when you squeeze a button on the handle. I think OXO is going to be one of my new favorite brands! Interesting to hear the back story. Why can't I have a husband like that! I grew up in a big Irish family and every night we had some kind of root vegetable that needed peeling. 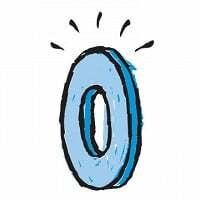 We didn't have an OXO though, we had the old skinny metal thing that left welts on your fingers, cramped hands and took forever!! It was either that or using a knife... I don't know which was worse! I now own 2 OXO peelers and my kids will never know how tideous peeling vegetables used to be! This may sound silly, but it's true, this is my favorite kitchen tool! I remember peeling carrots with an old peeler my mom had and how much I hated it because it just didn't work well. 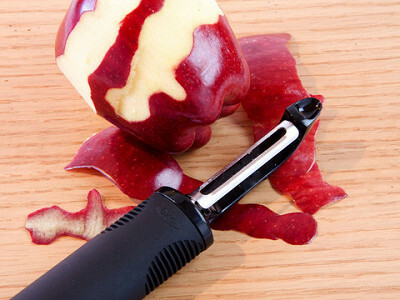 The OXO peeler makes peeling anything easy! And, my 6 yr old daughter even likes to use it and I don't have to worry about her slipping and scraping her hand. Very good post. Anticipating the next one. Simple, beautiful, comfortable. This is the tool that launched OXO, a company that pioneered universal design in everyday utensils. The romantic back story: One night, while then-retired housewares executive Sam Farber and his wife Betsey were preparing dinner for friends, he noticed how much it hurt Betsey to peel apples for a French tart. Farber vowed to create a better peeler for Betsey, who suffered from mild arthritis. Hundreds of prototypes later, Betsey got her new and improved peeler and an innovative company was born.